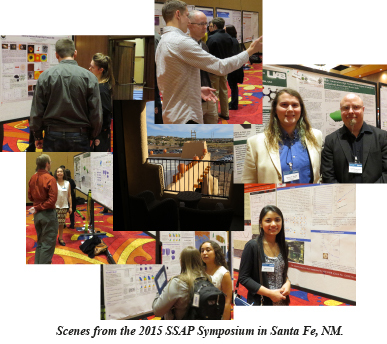 The annual Stewardship Science Academic Programs (SSAP) Symposium was held in Santa Fe, NM on March 11-12, 2015. CDAC Coordinator Stephen Gramsch gave an overview of the Center and its accomplishments in the scientific program, education and outreach, and technical developments during the past year. The pdf file of the presentation may be accessed here. At the poster session, 18 CDAC graduate students presented their work. Attending the symposium were Will Bassett and Will Shaw (Illinois), Kierstin Daviau (Yale), Sakun Duwal (Washington State), Max Gianetta and Feng Lin (Utah), John Lazarz (Northwestern), Lisa Mauger and Fred Yang (Caltech), Jinhyuk Lim (Washington University-St. Louis), Jeff Montgomery and Spencer Smith (Alabama-Birmingham), Greg Hohensee (Illinois), Sulgiye Park (Stanford), Jeff Pigott (Ohio State), Andrew Shamp (Buffalo), Hannah Shelton (Hawai'i), and Eloisa Zepeda-Alarcon (UC-Berkeley). Eloisa Zepeda-Alarcon received a Best Poster Award for her presentation. This is the second time that she has received a Best Poster Award at this meeting. CDAC Academic Partner Raymond Jeanloz (UC-Berkeley) gave a presentation entitled "Journey to the Center of Jupiter: Recreating Jupiter's Core on Omega," which described recent experiments carried out at the Omega laser facility. CDAC Academic Partner Yogesh Vohra (Alabama-Birmingham) presented "Studies of Rare Earth Metals and Alloys Under Extreme Conditions." Former CDAC Academic Partner Tom Duffy (Princeton) presented "Structure of Molybdenum to 1 TPa," which also described work done at Omega.